We nearly didn’t go to Rottnest Island. The boys and I were busy saying our goodbyes after what had been an amazing two years living in Perth. 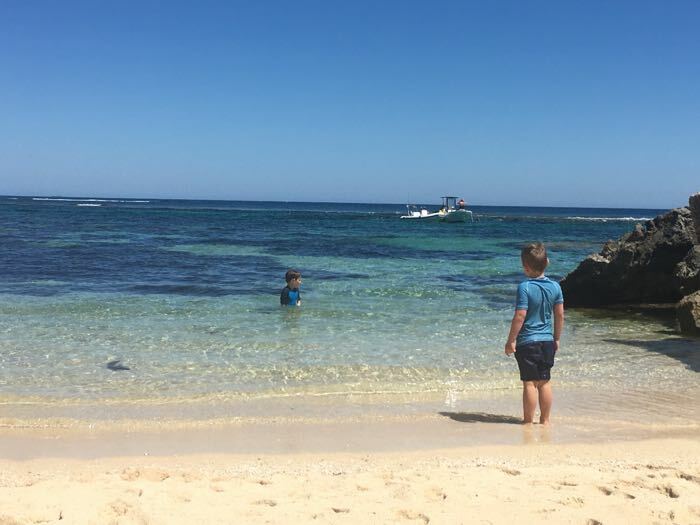 Rottnest was always on our bucket list. 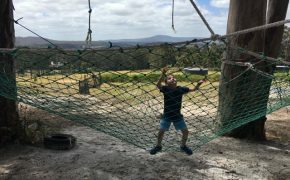 Everyone had told us it was a must-do while we were living in Western Australia. If we didn’t do it now we would never do it. With less than a week to go until our move to Sydney we jumped online to book a ferry for the next day. What we didn’t realise is exactly how popular this destination is during the Summer months. Booking for the next day or so was not an option. A miracle happened and we made it over to ‘Rotto’ (as the locals say) for a day. We totally agree that exploring this unique protected nature reserve with perfect white sands and turquoise waters is somewhere you have to experience. We literally saved the best until last. Despite last-minute planning I feel like we saw all we wanted to and more. 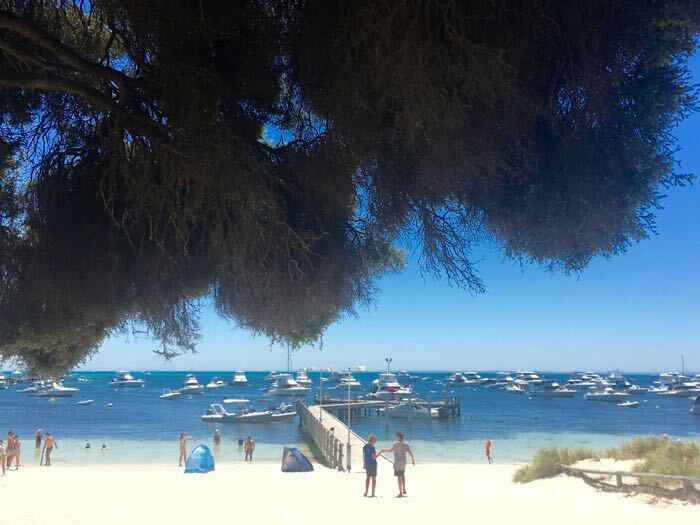 As promised I’ve put together a few must-have tips to make sure you don’t miss out on experiencing all that Rottnest Island has to offer in one day. 1. Take your beach gear in a backpack. A flimsy hard-to-carry beach bag will make life difficult if you’re planning to explore the whole island. 2. Pack some light, compact snacks and water bottles as food and water is only available at the main village. It’s thirsty work sitting on the beach in the heat of the day! 3. From Perth, you’re just a short 30 -45 minute ferry ride away. 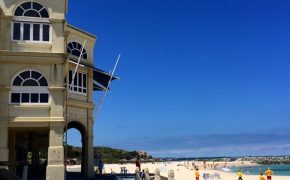 Head to either Hillarys Boat Harbour in the North or Fremantle in the South. There’s plenty of parking available at both ferry terminals. 4. We found out the hard way you need to book at least a few days ahead during peak season. 5. Keep a look out for Cheap Tuesdays with Rottnest Express Ferry and discount coupons found in various travel brochures around Perth. 6. As part of your ferry ride don’t be surprised when you are prompted to pay an additional island ‘landing fee’. Everyone has to pay this. 7. Sit on the bottom deck for a less bumpy ride. You’ll know what I mean once you’re on the ferry! A seemingly calm ocean made for a pretty rough journey up the top. 8. Take a change of clothes for you and your little one if it’s looking extra bumpy or if you’re kids are prone to sea sickness. Better safe than sorry! 9. There are roads on Rottnest Island but I love that there are no cars. The main form of transport is bike and it’s cheaper to take your own however you can hire them once you’re on the island. 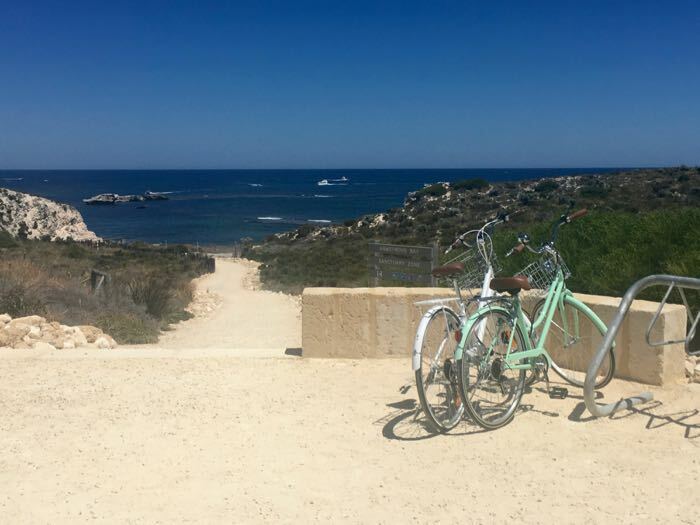 The cheapest way to get around Rottnest Island is on your own bike. 10. We opted to take the Island Explorer bus which I would recommend for little legs on hot days. It was a great way to explore the whole island as you can hop on and off at the various beaches and walking trails. Purchase tickets at the Visitor Information Centre near the ferry jetty and under 4 years rides free. There are extra buses running in peak season. 11. It’s possible to walk to a few of the popular beaches located a short distance from the ferry jetty and main village. Pick up a map from the Visitor Information Centre. 12. Take a short nature walk and try your luck at spotting NZ Fur Seals at Cathedral Rocks. The Island Explorer bus stops here. 13. Pull up a chair with a stunning ocean view at the iconic Hotel Rottnest. Enjoy a pub lunch while the kids run wild and jump off the jetty from the beach below. The food options are great for the whole family. You can even catch a glimpse of Perth from here. The beach view from our table at the Hotel Rottnest. 14. Relax at one or several of the stunning beaches. The benefit of taking the Island Explorer Bus is like us, you can stop at the quieter beaches such as Little Armstrong Bay. You might even be lucky enough to get the whole beach to yourselves. Alternatively Pinky Beach and The Basin are popular beaches walking distance from the ferry terminal. 15. Grab a quokka selfie. Yes this is a thing and it’s the ultimate Rottnest Island souvenir! Quokka’s are known to be the cutest and happiest creatures in Australia. They are native to Western Australia, very friendly and easy to find on Rottnest. We spotted them in the most unlikely areas outside shops and where there were loads of people. 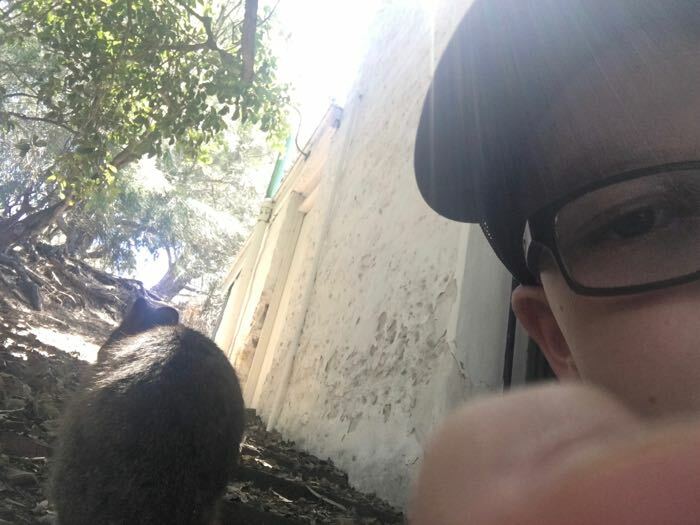 I found it hilarious watching my little dude attempt to angle my phone to get a selfie with a quokka. He eventually realised it was best to lie down and was very excited when he finally nailed it. Consider this a quokka selfie tip. You can thank me later! My little dude’s attempts at getting a ‘quokka selfie’ were hilarious. 16. Try snorkelling the limestone reefs which are home to many corals and colourful fish. We didn’t get a chance to do this however our bus driver informed us that sheltered Little Salmon Bay is a great spot for kids to snorkel. It looked very protected and safe for kids. You can hire snorkelling gear at the main village or bring your own. 17. 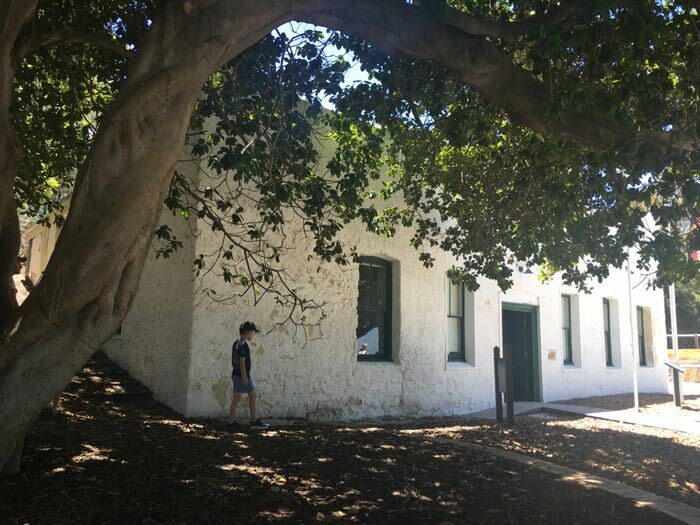 Take a stroll through the village shops to get a feel of what the locals do when in Rotto. 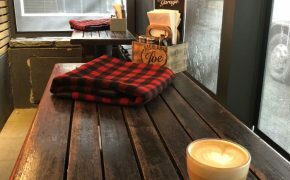 There’s an art gallery to wander, several spots to eat at and a small kids playground if your little ones need to burn some more energy. Exploring the village art gallery. There were loads of quokkas in this area. 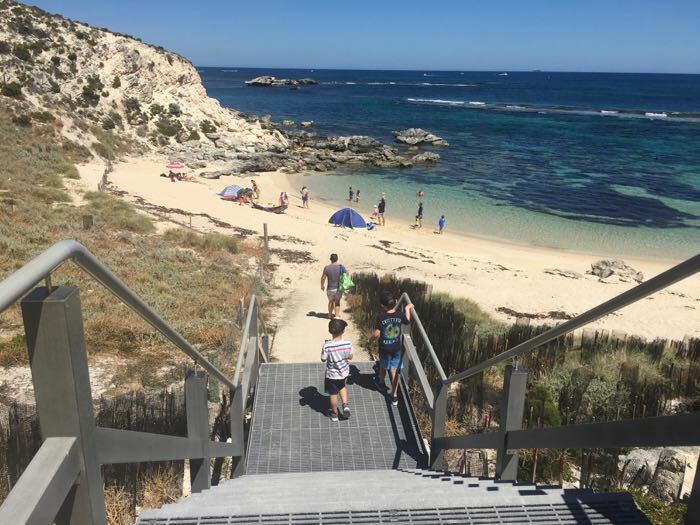 Please feel free to let me know in the comments below if you have any other tips for visiting beautiful Rottnest Island. Enjoy! Rottnest Island is a place we would love to visit. Every photo I have seen the water is the most beautiful blue & sand white like flour. I didn’t realise it was that close to Perth! Great tips, especially booking in advance & cheap Tuesdays. Hopefully we’ll get there one day & we’ll be able to use your guide. Mum to 2 Lego crazy boys on a mission to explore. Inspiration for the little people in your life, especially boys. Get the latest blogs, giveaways, events and exclusive deals straight to your inbox! © 2019 Your Boys & Mine - All Rights Reserved. Website by Pixel Whip.